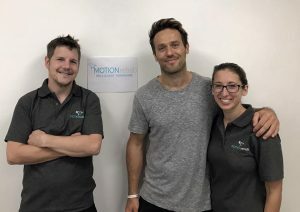 On Thursday 10th August 2017, Paul Spence from PAUL For Brain Recovery visited MOTIONrehab® and met with the team in Hull to look at the Neurological Physiotherapy Services MOTIONrehab® provide. It was a really positive meeting and MOTIONrehab® and the team are looking at how we can work together going forward. PAUL For Brain Recovery is a charity that was founded by a brain injury survivor – Paul Spence. Paul started his brain recovery in 2012. He faced a long difficult recovery and realised the lack of support in the community. Often people are left lost, lonely, confused and vulnerable after brain injury. The injury can come with devastating consequences and be life changing for everyone affected. For those reasons, there needs to be somewhere to go, a lifeline, a place where they can get comfort, support, education and inspiration. PAUL For brain recovery exists to make life easier after brain injury by providing advice and support to empower all affected by brain injury. After being discharged from hospital due to a stroke, I contacted MOTIONrehab after a recommendation from a friend.